In the audio world the old saying “you get what you pay for” definitely applies. It’s not to say that you always have to pay big money for the latest and most expensive gear, but I do recommend that you always do your research before you let go of a chunk of your hard earned dollars when making a decision to purchase any gear. Over the years I have come to trust certain industry standard name brands such as Pioneer, Mackie, QSC, Technics (now owned by Pioneer), Rane, Numark and also Sony for certain gear. Below I will share with you some of my personal picks and why I trust and/or use the particular brands and gear. There are two kinds of mixers, DJ mixers and live mixers. You can click here for detailed information on both but I will jump right into my favorite mixers. 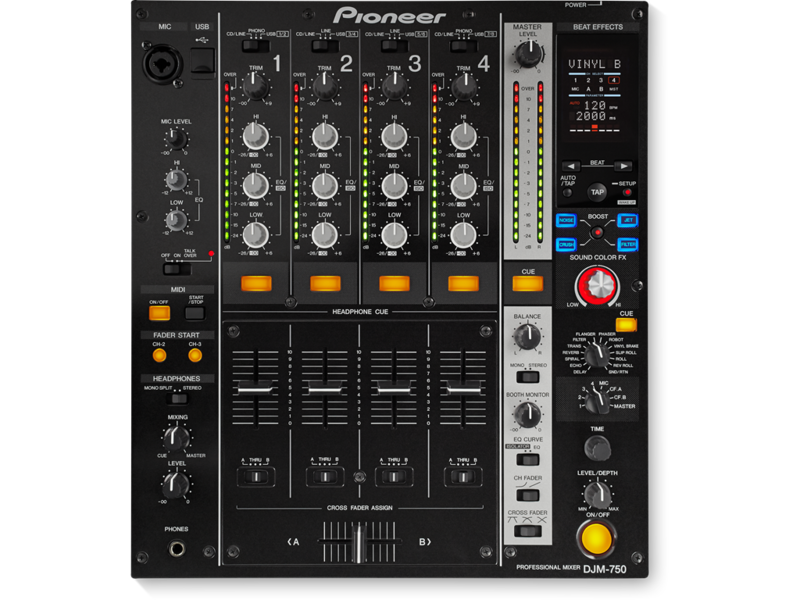 The Pioneer DJM-750 is a mid range affordable and well rounded digital DJ mixer that’s has most of the bells and whistles of Pioneer’s top of the line version, the DJM-900NXS2 without the 2k price tag. The DJM-750 falls into the $1000 range and has everything you need to be used as a perfect home studio DJ mixer as well as a solidly reliable club or mobile DJ mixer. Loaded with a bunch of the popular built in effects, 4 channels all with line and phono inputs, a total of 5 outputs (2 master outs, 1 booth out, 1 record out, 1 digital out) in addition to the return and send ports. It is also supports MIDI and Rekordbox. I also like that the master channel is painted grey so you can identify where the master, balance and booth knobs are located. DJ booths are usually very dark and it’s sometimes possible to turn the wrong knob when reaching to adjust your booth levels. You especially don’t want to accidentally turn the balance level as you’ll end up turning off the right or left side speakers; I’m guilty of doing that very thing on a few occasions, it’s so not cute. I only see two drawbacks. One is that it is not Serato or Traktor ready so you will need to connect your Serato SL box or Traktor soundcard to use it with Serato or Traktor. The other is that it has only one port for a microphone. however I like that’s it’s located on top of the mixer making it easy to plug a mic in mid show if necessary and also the mic input port accepts both XLR and 1/4 inch connectors.